Our newest Polaris Ranger High Seat is here! 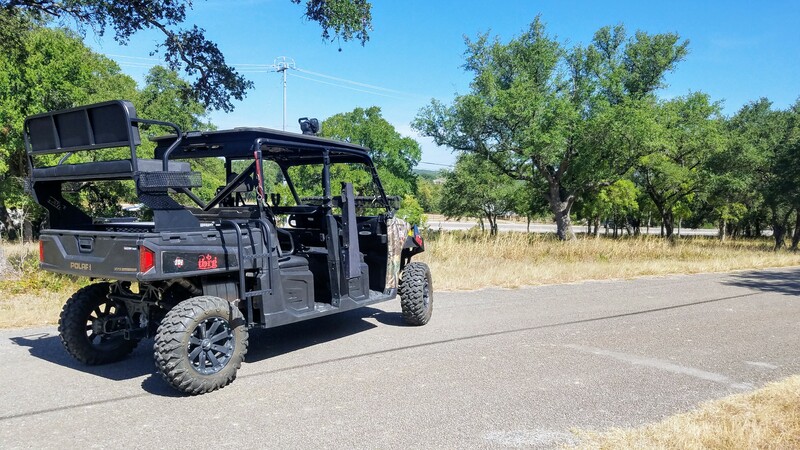 We call it our XL model because it is much larger overall then our standard Ranger Quick Connect high seat. The seat cushions are larger in width by 10 inches, while the foot platform has been extended 6 inches. Not to mention the XL style features our laser-cut style plate legs that really make the seat pop with flare. The XL Quick Connect high seat features 4 steel pegs/legs that go down approximately 4 inches into factory holes on bed sides locking the seat to the bed sides. With 4 steel pipes going into factory Polaris lock-and-ride holes, this helps assure that the bed won't warp or bend outward from seat and weight over-time. The seat secures to the bed with 2 lock-and-ride push plunger locks (we provide) using 2 of the front lock-and-ride holes on the bed. Installation can be done in less than a minute with two people. Getting in and out of the high seat is simple and convenient with folding ladders on both sides. The ladders use tread plate (commonly known as diamond plate) steps to help with grip when its wet and your boots are caked with mud! Foot platform is constructed of expanded metal with reinforced framing under it.